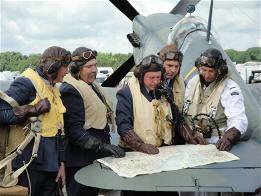 We are a multinational group of aviation and history enthusiasts portraying British Commonwealth flying units of World War II. 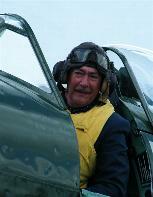 Our original portrayal was and still is that of "Glasgow's Own" fighter squadron, 602 Squadron, Royal Auxiliary Air Force. However, over the years, we have expanded our portfolio to also portray 417 (Fighter) and 419 (Heavy Bomber) Squadrons, Royal Canadian Air Force, as well as Fleet Air Arm. 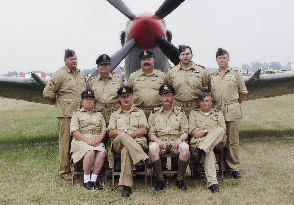 We are proud to be the RAF chaps (and girls) within Warbirds Living History Group, the Experimental Aircraft Association's (EAA) resident reenactor's group at its annual EAA Airventure event at Oshkosh, Wisconsin. In fact, 2013 marked the tenth year the reenacted 602 squadron has been present at Airventure (or simply "Oshkosh", as most call it). We are currently in the process of re-designing our presence on the web. Please be patient and check in from time to time while we work on adding more content, time permitting (unfortunately, we all have to work to pay for our hobby).